Happy Thursday friends! Today I'm back with another giveaway, this time it's for a Quo Summer Beauty Kit, valued at $100! Quo is a Canadian brand, and this giveaway will be open to all of my Canadian readers for 2 weeks. Look out for full reviews on these products over the next 2 weeks! Quo is available exclusively at Shoppers Drug Mart. I love the eye shadow palatte, trying to convince myself I don't need more eye shadow, but you really can never have too much lol. Awesome giveaway! I love Quo products and would love to try more. I think Quo makes some pretty awesome make up! Thanks for this giveaway! I wish Quo was sold online. Honestly. That would be super. Also, your photos look AMAZING! I always look at Quo products when I'm at Shoppers, but I've never tried them. Don't know why though. Would love to try the lip tint! 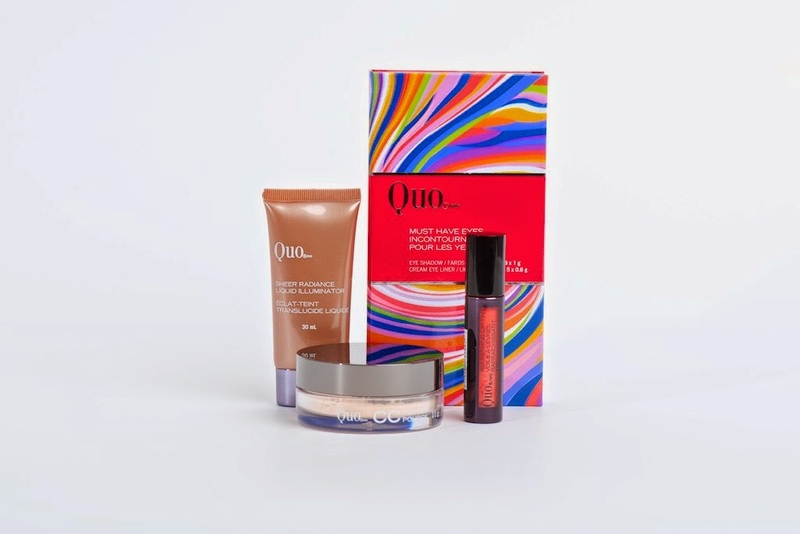 I've never tried Quo cosmetics but would love to give them a try. I have never tried Quo products before, hope I get a chance to try it! Thanks for the great giveaway. I have a few Quo eyeshadows and brushes that I really like. ohh awesome giveaway,,would love to try the Quo eyeshadows,,it all sounds great! I have never tried this brand of makeup! Would be great to have the chance to try it. Haha!! I absolutely love highlighters, I don't think that you can overdo it! I haven't tried many Quo products so this would be fun to win! I love Quo! Thanks for such a cool giveaway! This fellow beauty blogger hopes to win! Would love to team up and share your blog with my tens of thousands of readers! These are products I have been wanting!! Lovely set! I find Quo is really underrated! I love Quo! Their brushes have lasted me for YEARS and they come up on sale every now and then at SDM. Perfect time to stock up! Only just found you today. Having fun exploring your work. I love Quo products and your site! I just stumbled on your blog tonight! Looking forward to future readings, thank you for the opportunity to win such a great prize package! I hope you have a beautiful week. I like your giveaway!! never seen so many products all together! !thank you for the chance!!! I've been use several Quo products and have been impressed with their quality especially at the price point. Several of their brushes are my go-to brushes.